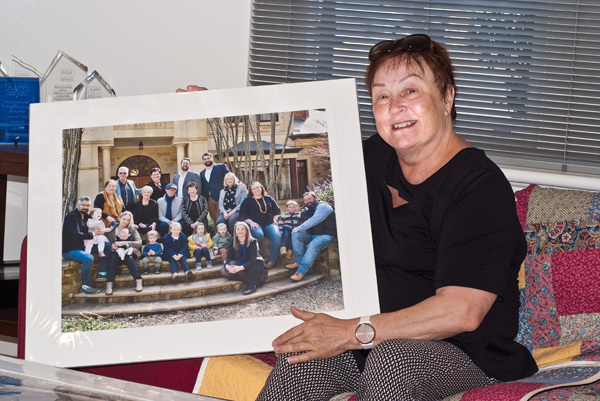 A multi-generational portrait is now safely in the hands of a happy owner. Family trees can be greatly enhanced when an image of the person is included. So if you find an old, worn-out photo, arrange to have it restored and enlarged to suit your needs. Future generations can enjoy the names and images and see if any family members have inherited the facial characteristics of their ancestors. Black and White Photography is timeless. No matter what technological advances are made in the world of photography, a black and white portrait is timeless. When you observe a baby in person and you're unsure who the child looks like, a photograph can quickly give you the answer! Family albums are treasured heirlooms. A sunny day at the beach with a cool summer breeze was the opportune time for a photo shoot. The sound of the gentle waves rolling onto the sand gave a serene experience for the family and allowed to recapture the moment on camera. A ‘Box of Treasures’ takes on another meaning when a collection of matted photographs is kept in a shiny box. How often do we include our iconic hometown landmarks in our photos? Giving attention to grooming is an important part of this type of photo session. For example, no one wants to see a lop-sided tie on a person’s professional business card! Again we had an opportunity to photograph these wonderful teenagers for foundation 21. They are a great group of ambassadors for this organisation. We had such a great time! The warm weather was a welcomed change to the wet cyclone weather. Despite the sunny conditions, the photo-shoot provided an intimate moment with the family. The natural and friendly environment of the family saw a relaxing and enjoyable session. As I scouted the area for potential scenes, I considered how the family would react, and how the composition would work. The photo shows the attentiveness of the children, and the joy that comes with working with children. The inaugural JDRF Gala Ball was a successful event as its aim was to achieve significant donations to fund the research for a cure for childhood Type 1 Diabetes. A progress report on the latest potential remedies was delivered and this gave hope to many parents and children present. It was a privilege for Face Photography to be the official photographer for the event. The loving bond between grandparents and grandchildren…priceless.